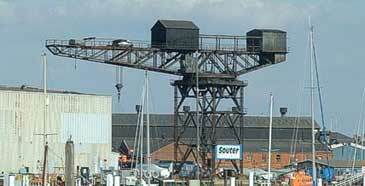 The historic importance of the Cowes crane has been recognised with a Grade II listing. Unfortunately it is sited in an area due for redevelopment and some doubt remains about the manner of its preservation. The 80 ton 'hammerhead' crane was ordered by Cowes shipbuilder J.S. White in 1911 and came into use the following year. It was the key element of a new fitting-out quay, as part of White's increased capacity for the production of naval warships. The crane was designed by Babcock and Wilcox and engineered at their Renfrew plant, but it was the only giant cantilever crane they ever built. This type of crane would eventually dominate the skyline of shipyards throughout the world. The Cowes structure falls within the first decade of their development and is probably the earliest example in existence beyond the Clyde. Giant cantilever cranes were born out of Britain's all-powerful shipbuilding industry in the early 20th century. They became essential structures for the fitting-out of ships in the age of iron and steam. The term 'hammerhead' is often applied to these cranes but, strictly speaking, it refers to the design of the German 'hammerkran' crane, a few of which were built for British shipyards at the start of the century. The British giant cantilever crane was of quite different design and ultimately more widely developed. The first example was of a design dictated by a particularly demanding topography on Wreath Quay, Sunderland in 1905. Thereafter the cranes were specified by all the leading shipbuilders, port authorities and navel dockyards. They were built on the Clyde from 1907 and continued in England, on the Tyne, from 1909, mostly of around 150-200 tons. In the following decades they were erected at major shipyards in Britain and throughout the world, right up into the 1970s. In total around 60 were built worldwide. There were four British firms principally involved in their construction. Sir William Arrol & Co were the pre-eminent builders of such cranes, carrying out the whole of the contract in-house, including the civil engineering work in the foundations. Arrol built 14 giant-cantilever cranes in the British Isles. They also built a small number for overseas customers. The Glasgow electric Crane & Hoist Co built 5, although the structures were sub-contracted to other firms, as were a number built by Cowans Sheldon. Stothert and Pitt had collaborated with Arrol in supplying the mechanical portion of the contract for the first 4 cranes by the latter firm. They went on to construct 6 giant cantilever cranes as principal contractor. These, apart from Babcock and Wilcox, were the only British firms involved. The common architecture of giant cantilever cranes makes them immediately recognisable, with a dominating presence that seems to personify the status of their industry. There were however a range of different mechanisms employed throughout their development; indeed each crane can be considered a unique structure (The Cowes crane owes little to contemporary designs and its distinct appearance arises from a second housing, over the trolleys). Little more than 15 of these cranes still exist anywhere in the world. On the Clyde, the 5 remaining cranes have been given the highest grade protection by Historic Scotland. One of these is being preserved as part of a waterfront redevelopment scheme. Just 3 cranes remain in England, of which only the Cowes example has been recognised as historically important, with a Grade II listing. The question of protection has also arisen elsewhere in the world, notably in Australia and America. "There are not a large number of Giant cranes in existence throughout the whole world. The construction of a new Giant is a fine piece of engineering work which is not often repeated. The birth of a Giant is probably a rarer event than the launch of a big Atlantic liner. Also, a Giant has a long life. It does not wear out or become obsolescent in a matter of a quarter of a century, as a liner does. Consequently the construction of Giant cranes is never likely to become a regular routine business but will doubtless remain the exceptional or occasional job of a very few firms possessing a suitable works organization and equipment." The tradition of shipbuilding at Cowes stretches back as far as the early 17th century, although, until the 20th century, the shipyards at Cowes were more often engaged in the maintenance and repair of merchant ships en route for Europe. The first documented ship was built at East Cowes in 1622. Early ship construction, mainly merchant ships for the Virginia Company, was replaced by contract shipbuilding for the Royal Navy by the end of the 17th century, when Joseph Nye built a 5th and a 4th Rate at East Cowes. From the 1740s Britain was regularly at war in various parts of the world and this created a new demand for warships, which was partly met by contracts with private shipbuilders. East Cowes shipyard was once again used to build vessels for the Royal Navy and a steady stream of ships were launched by various shipbuilders. Smaller craft, such as cutters, hoys, smacks and ketches, were also constructed in a number of yards, located along the High Street in West Cowes. In the late 18th century yards were set up at Point, either side of the present floating bridge slip. Several shipwrights developed solid reputations for building small trading vessels, smuggler craft and revenue cutters. In the early 19th century an established Broadstairs shipbuilder, Thomas White, relocated to Cowes and eventually took over yards on both sides of the Medina at West and East Cowes. Thus began the development of shipbuilding to a scale that would dwarf past endeavours. During the 19th century White's built a large range of craft from floating bridges to merchant ships and paddle vessels, also earning a steady income the from repair and refitting of merchant ships. By the 1870s Lifeboats were made in numbers. 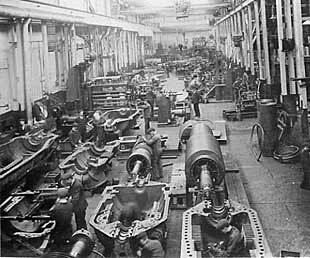 The company were also building the new torpedo boats and, as a result of this experience, they were sought out by the Admiralty to develop torpedo boat destroyers, a design for which they earned a notable reputation. By the 1880s White's had lost a good deal of their repair work to the new docks at Southampton. Adapting to this set-back, the company filled in its docks on the West Cowes side and developed the engineering part of their business, building steam engines and turbines, boilers and diesel engines. The ship construction side of the business was carried on over at East Cowes, while fitting-out was undertaken at the West Cowes quays. 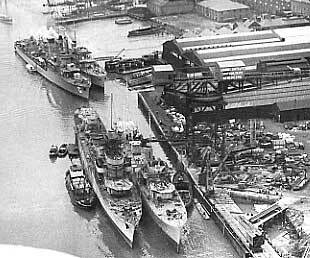 The crane was part of redevelopment for fitting and repair of the heavy machinery that would power over a hundred destroyers and other naval vessels, launched in the following decades. It has been estimated that in 1914 over 75% of the commerce and trade of Cowes depended on White's shipyard. The work force numbered around 2,000, rising to 3,500 by World War II. Their contribution to the war effort can be gauged by their visits from the Luftwaffe. Soon after the war, the world saw a slump in shipbuilding demand. By 1961 J.S.White were feeling the effect and attempts to find work became desperate. Before the decade was out they had suffered the same fate that would befall most of British shipbuilding. Towards the end of the 19th century Britain emerged as the world's biggest and most influential shipbuilding nation. The British shipbuilding industry, in its strategic importance and penetration of overseas markets, and its role in the civilisation of much of the world, stands above just about every other industrial endeavour anywhere. As the cities and towns which were built upon this industrial power continue to develop, the evidence of their source is being rapidly stripped away. Today Cowes it is renowned as a yachting centre but its housing and infrastructure arose out of the wealth and employment created by its shipbuilding industry. There are over two thousand listed buildings on the Isle of Wight. Yet only the crane remains as a symbol of the enterprise and skills generated by the Island's most prestigious shipbuilder, at the peak of over three hundred years of achievement. What is heritage if it does not include a landmark monument to such major history? Our thanks to Brian Newman for guidance on the technical and historical aspects of giant cantilever cranes.